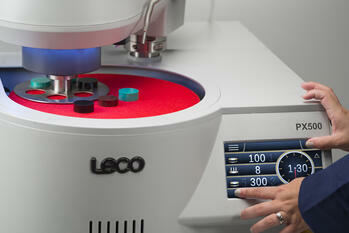 New Video: See Our PX400/PX500 Grinder/Polisher in Action! Our PX400/PX500 grinder/polisher emphasizes ease-of-use while delivering exceptionally flat specimens to help you keep your metallography lab running smoothly. Designed with the latest technology, the PX400/PX500 provides an efficient, safe, reliable, and clean grinding/polishing solution through a number of new and improved features to streamline your sample preparation. Up to five programmable, metered fluid dispensers deliver consistent suspensions and extenders to meet every polishing objective. All of LECO's metallography products feature a world-wide team of service and support professionals, ready to answer any questions or provide assistance should users ever need it. 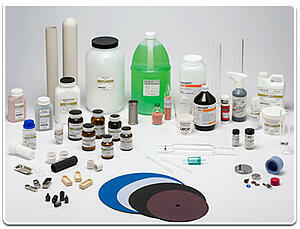 In addition, a variety of consumable products are also available to help you achieve the most reliable results. Learn more about the PX400/PX500 here, or check out the quick video overview below, which shows its easy operation and further features.